LIFETIME STRUCTURAL WARRANTY Our warranty is an unequivocal statement of confidence in the quality of our wheels, which go through the highest standards of testing and quality control, yielding a range of far superior products that we’re proud to brand Ferrada. This stringent process of extensive testing and inspection is the reason why we’re able to provide a lifetime structural warranty in the event of a structural failure caused by a manufacturer defect – proof that we stand behind our workmanship, 100%. 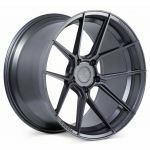 Each individual wheel is subject to intense inspection by our manufacturer prior to packaging, as well as a secondary inspection prior to customer shipment in order to guarantee perfection in our product.